The 17th century was the peak period for Hot tribe of Balochs, settled in Multan province of Mughal empire. Their chief, Ismail Hot , sent presents to Shah Jahan and secured a patron in Dara Shikoh. Taking advantage of his position on the boundary between two provinces, he now claimed to be subject to the governor of Lahore and refused to admit the jurisdiction of the Subahdar of Multan. Aurangzeb was prepared for this subterfuge. He had mentioned the case in audience with Emperor and got his answer that Ismail Hot was in future to be subject to Multan. The Hot chief, on the strength of a letter of Dara's, refused to wait upon the new governor of Multan, and continued in his career of aggression. He took three forts from Mubarak of Babri, another Baloch chief. Aurangzeb armed with Emperor's sanction, at once asserted his authority and sent a force to restore the forts to their rightful owner. But during Mubarak's absence, Ismail conquered the forts again. Several measures were now taken against him ; he was compelled to surrender Mubarak's possessions and to pay his respect to the prince at Multan. (20th June, 1650). Aurangzeb now conciliated him, as he was a rich chieftain with a good body of armed retainers , and could assist the imperial government in subduing the Nohani tribe and also supply provision during Qandahar war. Another Baluch tribe, which has now declined and almost disappeared, is the Nohmardi , the hereditary enemy of the Hots. But their power in 17th century was strong enough to cause anxiety to the government. Aurangzeb at first tried to win over Alam, the Nohmardi chief, whose lands adjoined those of the Hots and lay across one of the shortest roads from Multan to Qandahar.But his friendly letter produced no effect, the chieftain refused to wait on the governor at Multan. So Aurangzeb took steps to expel him by force , after getting sanction from the Emperor. In Kirther and Lakhi hills separating Sindh from Balochistan, dwelt many lawless men of Nohmardi and Jukia tribes. In Akbar times the former clan could place in field more than 7,000 men. Their strongholds were Bela and Kahra, from which they sallied forth to rob and to slay. No ruler of Sindh , from the days of Tharkan dynasty , had extorted even a nominal submission from these border Brigands. Aurangzeb sent his able lieutenant, Malik Hussain, of the Afghan tribe of Abdali, against them. The force marched for ten days beyond the frontier of lower Sindh , exacted promises of submission and tribute from Harun and Khatartal (the Nohmardi chiefs) , and Murid (the head of Jukias) and caused the Emperor's name to be read from the pulpit as a public mark of suzerainty. This show of strength evidently had a good effect on the neighbors , for Jafar Nohmardi, a Kinsman of the zamindar of Panjghur and Kech Makaran, and four other chiefs offered their allegiance to the imperial government. 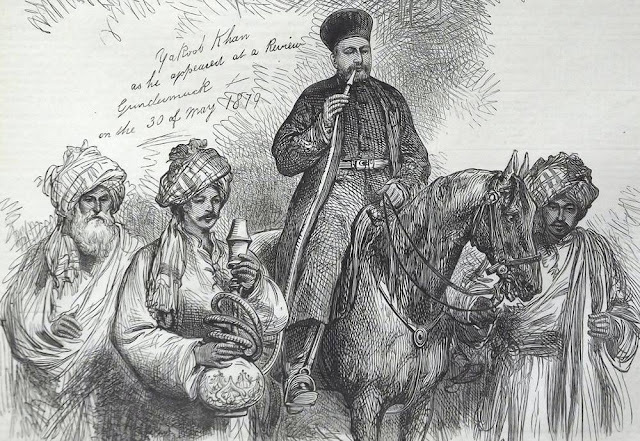 Another Nohmardi chief named Madh , had descended from the hills of Southern Afghanistan to raid Bela and Kahra. But Malik Hussain Abdali with imperial troops made a forced march of 140 miles , and surprised the robber's camp , slaying him and bringing away his daughter and forty of his retainers as captives. Thus the Emperor's suzerainty was publicly declared throughout the coast tract of Makran , and the army returned to Tatta with flying colours. Sasta Hala , the son of zamindar of Kakrala , paid a visit to Aurangzeb at Multan , but in the meantime his rival crossed over from Cutch and seized his lands. A detachment from Shah Hussain Abdali's forces, assisted by a gunboat , drove away the usurper, who fled without standing the battle. Every lawless men and frontier clans felt that they had got a new master , who could not be safely defied.